Found 76 file extension associations related to dBASE and 66 file formats developed specifically for use with dBASE. dBase was the first widely used database management system (DBMS) for microcomputers, published by Ashton-Tate for CP/M, and later on the Apple II, Apple Macintosh, UNIX, VMS, and IBM PC under DOS where it became one of the best-selling software titles for a number of years. dBase was slow to transition successfully to Microsoft Windows and gradually lost market share to competitors such as Paradox, Clipper, FoxPro, and Microsoft Access. dBase was sold to Borland in 1991, which sold the rights to the product line in 1999 to the newly-formed dBase Inc. In 2004, dBase Inc. changed its name to dataBased Intelligence, Inc. Starting in the mid 1980s many other companies produced their own dialects or variations on the product and language. These included FoxPro (now Visual FoxPro), Arago, Force, dbFast, dbXL, Quicksilver, Clipper, Xbase++, FlagShip, Recital's Terminal Developer, and Harbour/XHarbour. Together these are informally referred to as xBase. dBase's underlying file format, the .dbf file, is widely used in many other applications needing a simple format to store structured data. dBase has evolved into a modern object oriented language that runs on 32 bit Windows. It can be used to build a wide variety of applications including web apps hosted on a Windows server, Windows rich client applications, and middleware applications. dBase can access most modern database engines via ODBC drivers. dBase features an IDE with a Command Window and Navigator, a just in time compiler, a preprocessor, a virtual machine interpreter, a linker for creating dBase application .exe's, a freely available runtime engine, and numerous two-way GUI design tools including a Form Designer, Report Designer, Menu Designer, Label Designer, Datamodule Designer, SQL Query Designer, and Table Designer. 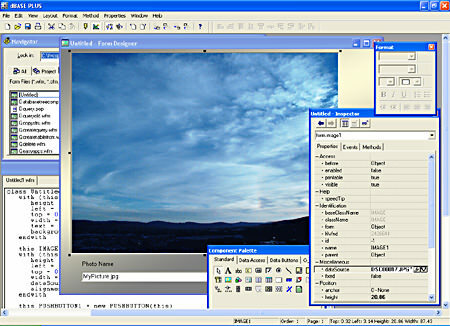 Two-way Tools refers to the ability to switch back and forth between using a GUI design tool and the Source Code Editor. Other tools include a Source Code Editor, a Project Manager that simplifies building and deploying a dBase application, and an integrated Debugger. dBase features structured exception handling and has many built-in classes that can be subclassed via single inheritance. There are visual classes, data classes, and many other supporting classes. Visual classes include Form, SubForm, Notebook, Container, Entryfield, RadioButton, SpinBox, ComboBox, ListBox, PushButton, Image, Grid, ScrollBar, ActiveX, Report, ReportViewer, Text, TextLabel and many others. Database classes include Session, Database, Query, Rowset, Field, StoredProc and Datamodule classes. Other classes include File, String, Math, Array, Date, Exception, Object and others. dBase objects can be dynamically subclassed by adding new properties to them at runtime. dBASE Plus is a rapid application development toolset that includes a modern object oriented programming language (dBL) that runs on 32 bit versions of Microsoft Windows. It can be used to build a wide variety of applications including web applications, rich client applications, middleware applications, and server based applications. dBASE Plus has robust database access support and can access most modern database engines including Oracle, SQL Server, Sybase, MySQL, Informix, DB2, InterBase, FireBird, Pervasive SQL, Microsoft Access and other databases that can be accessed via ODBC. In addition dBASE Plus supports access to its native .dbf tables (levels 3, 4, 5, and 7) as well as Paradox (.db) tables, FoxPro and Visual FoxPro tables. If you need more information please contact the developers of dBASE (dataBased Intelligence, Inc.), or check out their product website.